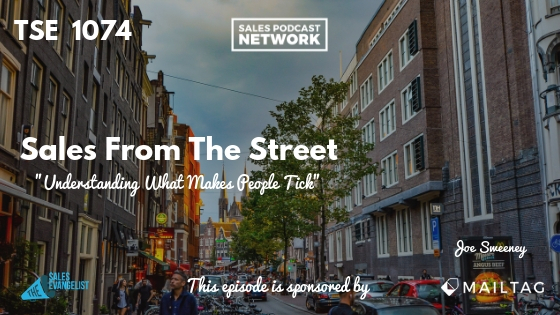 EditTSE 1074: Sales From The Street - "Understanding What Makes People Tick"
Human behavior plays a huge role in sales and understanding what makes people tick is one of the most important concepts sellers in all industries should seek to learn. 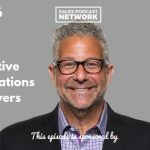 Joe Sweeney has worn a variety of different hats over the course of his career, but he loves human behavior and he says it’s the key to success in sales. You must understand why someone would buy your product. Joe’s philosophy, as described in his book Networking Is A Contact Sport, is that networking, business, and sales are about giving and serving rather than getting something. People ask about the number one mistake that salespeople make, and it’s believing that the process is about us. We think it’s about our product. It’s not. Instead, sellers tend to take the opposite approach and we talk about ourselves and our product. But your buyer doesn’t care about that. All he cares about is whether your product can solve his needs and relieve some of his pain points. Joe said he spent a portion of his life criticizing other people because he represented a lot of high-net-worth people who did stupid things. When, for example, he encountered a woman outside a hospital dying from emphysema and smoking a cigarette, he made the connection. The pleasure she got from nicotine was greater than the pain she experienced from emphysema. The takeaway is to get good at understanding what makes people tick without criticizing them. All human behavior makes sense, even when we don’t. Don’t be critical of their actions. Understand people’s needs and wants. Although we could all likely point to hundreds of needs, we really have three basic, common needs. We need to belong to something bigger than ourselves. We need to love and to be loved. Finally, we all want to know that our life has meaning and that we’ve made a difference. The greatest sales companies in the world have understood that. Perhaps our greatest need is the first one: the need to belong to something bigger. It’s counter-intuitive today because with all the social media we falsely believe we’re all connected but the truth is that we’re less connected than we’ve ever been. Stated another way, we’re more isolated now than ever. The company that really understands this concept is Harley Davidson. Its number one competitor is BMW which far surpasses Harley, but Harley outsells everyone. The Harley Ownership Group, or HOG, makes its owners part of something bigger. It’s about belonging. Remember the old TV show Cheers? Its tagline captures this desire. Sometimes you wanna go where everybody knows your name. In this technology world, we pretend that we’re connected to a massive network but we aren’t. Coca Cola marketed to this need with the ad about teaching the world to sing. It was kind of a kumbaya moment with people holding hands singing together. They portrayed the feeling that if you drink Coca Cola, you’d feel all this love. Coca Cola understood the Maya Angelou quote: People will forget what you say. People will forget what you do. People will never forget the way you make them feel. We all want to know that our lives have meaning, and Mastercard captured that with the ad campaign that assigned prices to different products. Fishing poles, $29. Worms, $3.25. An afternoon fishing with your teenagers, Priceless. Most of us approach the sales process with the sense that we have to tell people about our benefits. Instead, we should take two steps back and work to understand what makes people tick. Work to understand your buyers’ needs. The greatest companies do it and I recommend that your listeners do the same. If you’re going to be really good in sales, you should wow people. If you sell office furniture, what would differentiate you from the competition? Imagine that you have a customer who likes Egyptian art. At the close of your interaction with the customer, hand him a piece of Egyptian art that you printed out. It cost you nothing, but none of the other competitors will have done that. 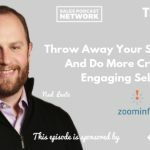 Joe suggests that sales isn’t about making money. Although that’s a by-product of sales, it’s really about creating an environment where we can service people. You can do the same thing in education and in government. Morph your sales job into a servant leadership role. Joe’s sister-in-law told him that she always assumed that business was a bunch of greedy people trying to make money. There was a negative energy around sales. Joe reframed it as a positive thing and created a forum where people can serve each other and get what they want in life. Daniel Pink wrote a book called To Sell Is Human all about humanizing sales. I needed that as a young seller when I was guilty of seeing CEOs as something other than human beings. I didn’t see a woman who runs a business and has two kids in middle school. Joe said he hates networking and what it represents. We tend to think of an alpha male chasing someone down with a business card. It’s about understanding pain points and needs and then responding to them. Many salespeople are too aggressive and competitive because we feel the pressure. Instead, we have to reframe networking and sales. It’s not about us, but that’s a tough concept in this narcissistic culture. Joe suggested using a 5-10-15 process in which he holds a minimum of 5 meetings, 10 pieces of written correspondence, and a minimum of 15 phone calls. It’s less about the numbers and more about the system. Your listeners could start with a 2-4-6 system. Make a plan that keeps you accountable to yourself. We’re basically all independent contractors and this kind of system will create internal accountability. You can connect with Joe at joesweeney.com/networking where you can access inexpensive online training programs. They can help your listeners move the needle in their business and sales lives but also in their personal lives. You can also grab a copy of his book, Networking Is A Contact Sport.